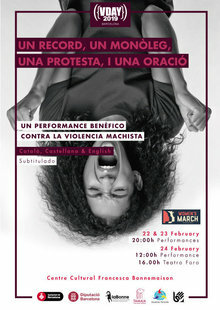 As a part of worldwide activities for V-Day, starting tonight, there will be three performances of selected pieces from A Memory, a Monologue, a Rant, and a Prayer - WRITINGS TO STOP VIOLENCE AGAINST WOMEN AND GIRLS by Eve Ensler. In Barcelona these are to be presented in Spanish, Catalan and English and the money collected from tickets sales will go to two associations that support women who have been victims of domestic violence: Tamaia Viure Sense Violència and Mujeres Palante. Venue: Teatre del Centre Cultural Francesca Bonnemaison. Carrer de Sant Pere Més Baix, 7, 08003 Barcelona.